In a recent post, I lamented the lack of low-carb convenience foods. A short while later, I heard from the Atkins company offering to send me some samples of their new line of frozen meals. Perhaps I should have wished for world peace or an end to global warming, but tasty, low-carb frozen food is not too shabby! Some stores are already selling the new Atkins products and they should be available nationally soon. The line includes breakfasts like Farmhouse-Style Sausage Scramble and Tex-Mex Scramble and dinners like Italian Sausage Primavera, Meatloaf with Portobello Mushroom Gravy, Chicken and Broccoli Alfredo, Roast Turkey Tenders with Herb Pan Gravy, and Beef Merlot. They only sent me the last three, so that is what my review is based on. I’m pleased to say that the new Atkins Frozen Meals exceeded my expectations; comfort food is a good description. The beef, chicken, and turkey were moist and tender, covered with delicious sauces, and paired with green vegetables. The portion sizes are generous and it is mostly real food with no extenders or starchy sides like ordinary packaged frozen dinners. The prices are remarkably low at about $3.50 to $4.50, but it varies with the store. Each meal contains from 4 to 7 net carbs and from 310 to 390 calories. They are very good and I predict they will be a big hit with low-carbers who don’t have the time, the skill, or the space to cook, or don’t want to bother with figuring out the nutrition counts, which is pretty much all of us at one time or the other. All the meals fit the guidelines for all phases of Atkins, including induction. Yes, the new Atkins frozen meals are very tasty, convenient, and perhaps a better choice than eating out. They can’t compete with fresh, home cooking, but for many people that is not an option anyway. I plan to keep a few in the freezer so I can take a vacation from cooking when my husband is away or when I have a deadline or need to test recipes that don’t work for a balanced meal. They would also be a good choice for college students or those who share living space with others who eat differently. I will probably add some salad greens and good fat, like pasture butter and extra-virgin olive oil, to compensate for the canola oil and to help keep me full. And since I’m long past induction, I can add some condiments, like sugar-free cranberry sauce to the turkey dinner. There will surely be questions about the ingredients in some of the new products, but the ones I tried listed meat and vegetables first and included real butter and cheese. They are processed foods, though, and they do contain some things, such as soy, wheat, canola, and MSG under various names, that are of concern to those who try to eat a healthful diet. (See below for more about MSG.) On the whole, these are better than most packaged meals available in stores and in my opinion, a better choice as a meal replacement than an Atkins bar or shake. Feel free to weigh in with your own opinion. I really don’t know whether MSG in processed food is worse than the natural kind. I often point out that a chemical is still the same chemical no matter where it comes from, but I try not to eat too much of it, just in case. I wonder if they have a doggie version of MSG that makes dogs get excited about eating dog food? I used to buy a very expensive dog food prescribed by the vet that listed peanut shells as the first ingredient. My dog loved it, but he was fat, nervous, and suffered from horrible allergies ~ I was too clueless back then to give him raw meat. Message to Ruffie in doggie heaven: I’m sorry. 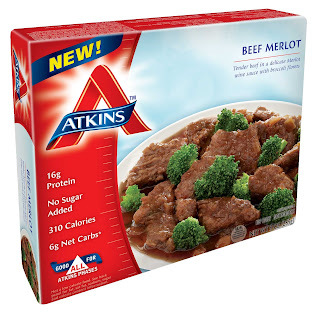 Atkins Products, Frozen Meals, MSG.. Bookmark. Haha!! – your delightful sense of humor comes out again! It's too bad about the MSG. Tomatoes never give me migraines but added MSG to processed foods almost always does. I also do not like soy or canola oil. Canola oil is highly processed and not at all healthy. I know. I was a secretary in the large engineering firm in Toronto, Ontario, where they "discovered" canola and made the product – however, they were engineers and not food scientists! Nice idea, but as per usual manufacturers always put something unhealthy in their products – be it something like maltitol that puts us in the bathroom for hours or MSG that gives us a sore head for hours. Ugh! I cannot wait for the day when we can easily purchase chocolate chips made from erythritol and sucralose – others would say, nooo rather erythritol and stevia – still way better than maltitol or one of the other problematic sugar alcohols like sorbitol or xylitol, or even polydextrose (problem for me) – eek! Thanks Jennifer! I should have been more specific about the soy. In the meals that I had, it was soy lecithn not soy oil, milk, or flour. I know that is an emulsifier, so probably in a very small amount. Not sure if that makes it OK for most people or not. As to chocolate chips, I like the Nevada Manna brand, but they do have polydextrose. ChocoPerfection discontinued the ones they sold which were made with oligofructose like their bars. That is similar to polydextrose as they are both indigestible fibers, so you may not tolerate that either. You might check with LC-Foods. Glen is still adding products to his line and is very receptive to suggestions. thanks for posting about your opinion of the Atkins frozen meals. I'm not sure if I will venture out to try one, but it is tempting to have a backup in the freezer for those times when hubby is not home for dinner. Soy lecithin – I would not have a problem with such a small amount. I think MSG (also implicated in obesity) is the biggie for me and for many other people too, so that is too bad. The little bit of wheat is less of a problem. Just saying…not that I am a customer as I live too far away. Regina Wilshire posted the ingredients for the meatloaf dinner, which lists various forms of MSG several times. I suspect that there may be a lot of it in some of the meals. Just a comment on MSG. "Chinese restaurant syndrome" was due to large amounts being thrown into food, primarily soup. In normal cooking amounts three is less glutamate than is found many natural foods. Glutamate is required in the diet — we did no evolve umami receptors in order to give ourselves intermittent flushing. I think it is obvious that excess of many things is not good but there is nothing inherently wrong with MSG. In fact, the effects of excess are due to the fact that it is a natural compound (neurotransmitter). As long as this is moderated. A criticism of your blog is white on black which is so hard to read. I was hoping someone with better credentials than mine would weigh in on the MSG issue. Thanks for the clarification! On the issue of white on black on my blog: I have had other complaints about this and some people are boycotting my blog because of it. I have tried to change it but have messed up other things in the process and had to revert to the old format. I think I need a total do-over with a new template, but I'm going to have to hire someone to help me do it. It's on my list! Thanks for the input.